Ghostvillage's popular podcast, Ghost Chronicles is now "live"! Step into the realm of the unknown, unexplained, and the unbelievable every Friday night from 10 PM to Midnight EST on www.toginet.com. Listen to Ron and Maureen and the rest of the crew of The New England Ghost Project as they broadcast live from haunted locations and other places of interest. Listen special guests like authors, experts, and victims of the paranormal. Be a part of the show by calling in to (877) 864-4869 and ask questions of the hosts and their guests, or share your own experiences. So... Don't Miss a Heartbeat, tune in to www.toginet.com every Friday from 10 PM - Midnight EST. Be Afraid! Be Very Afraid! Ghost Chronicles is coming and your world will never be the same! Ron Kolek is the founder and lead investigator of The New England Ghost Project. With a degree in Environmental Science, he was the ultimate skeptic. However, a near death experience changed all that. No longer blinded by his skepticism, he now uses scientific background to seek the truth about the paranormal. In addition to hosting Ghost Chronicles on Ghostvillage Radio, he hosts a weekly radio show on 1490 AM WCCM in Lawrence, Massachusetts, and writes monthly paranormal newspaper columns in The Stateline Review and Food and Spirits. Ron, his co-host, Maureen Wood, and his group have been featured on all of the major New England television channels including WBZ CBS 4, WHDH Channel 7, WCVB Channel 5, WMUR Channel 9, WNDS Channel 50, and others. His exploits have been documented in many newspaper and magazine article including Woman’s World. He has been a guest on several radio stations and is internationally known with features in the U.K., Germany, and China. Contact Ron at: ronk@ghostvillage.com. Maureen Wood is a fifth generation Psychic/Trance-medium. For as far back as she can remember, she has communicated with the deceased. At the age of fifteen, she was introduced to a woman who studied with Laurie Cabot (official Witch of Salem, Massachusetts). This woman took Maureen under her wing and guided her in ways to not only understand, but also control her gifts. At the age of 15, she served as a medium for adult séances. She has practiced, studied, and instructed metaphysical studies for more than twenty-five years. Maureen has been with the New England Ghost Project since 2001 and has accompanied the group on over 100 investigations. She has been featured on many radio and television programs and in newspapers and magazines. She has been hosting a paranormal radio program on 1490 AM WCCM in Lawrence, Massachusetts with Ron Kolek since 2003. 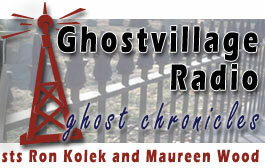 Contact Maureen at: maureenw@ghostvillage.com.